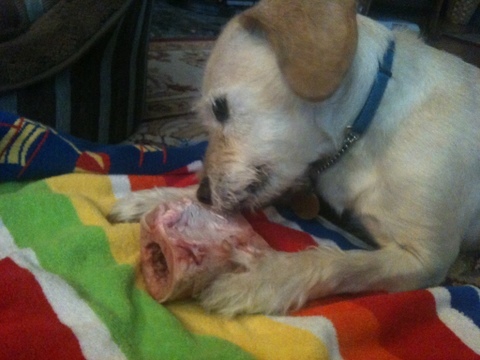 I posted a few months ago about the benefit of marrow bones to Wilson's dental health. We've been giving him a bone every weekend, and his teeth are in fine form. We have to put down a towel to protect the floor as they're kind of messy, but the bone keeps him occupied for a couple of hours and he really enjoys it. He's also been chewing on his non-edible Nylabone more, which also helps. The only problem is that if we don't supervise him, he will hide the bone somewhere in the house when he's finished with it and it can be kind of a shock to stick your hand behind a sofa cushion and find a bone, but I've managed to keep track of most of them so far! We'll be boarding him for a week while we're in Rome, and I'll send a couple of bones for him while we're gone, as an extra treat, and to allay some of our guilt about kennelling him.